A contraction of Balmain and mania, Balmainia has fuelled passions since first hitting the scene in 2006. The brand's aficionados cannot fail to be pleased - the Maison de St-Imier is presenting its collection in a new light, with an outstandingly extravagant Chrono Lady version. Watch out for utter folly! When Balmain reworks a line, it does so in depth. Without losing its original soul. Everything contributing to the success of Balmainia, like the imposing case and extravagant dial, still features in the new settings. Discover the rest (again). The bezel is now decorated with notches. The left-hand rim inherits a logo decorated with two screws. The silvered dial maintains this zest for classicism and a dose of extroversion with its august Arab numerals. Other new features worthy of note - a strap with a double-snap clasp (increased comfort and functionality) which seems capable of moving at any time. 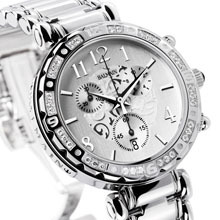 The more sporty, more urban, more outgoing Balmainia Chrono Lady has a variety of luxurious features - 34 Wesselton diamonds on the bezel, a black and white mother-of-pearl dial and a silicon strap. More than enough to incite passion, no sorry, to spark a new Balmainia!